The first decision of completing the Dix Mountain Range is deciding which way you want to do the loop? Doing the loop in the clockwise direction will have you crossing over the high water bridge and continuing up to Dix for your first peak of the day. Counterclockwise will have follow the herdpath from underneath the bridge along the brook, this will bring you all the way up Macomb Slide to the summit of Macomb. I chose to run this loop in the clockwise direction going up Dix first and later finishing with Macomb. 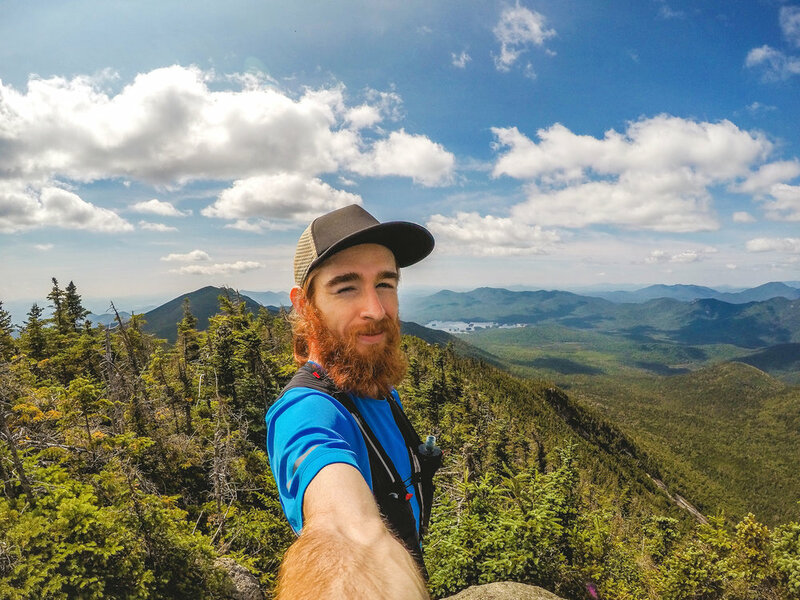 The view from Dix is superb, a beautiful 360 degree view of the surrounding Adirondack High Peaks as well as a sneak peak of the last four mountains you have yet to traverse. The climb up to Dix can be quite strenuous as the 2.3 mile section is fairly steep and unforgiving. This climb will lead you to the top of Beckhorn, from which you can see the last .4 miles of easy hiking to the summit of Dix. Pronounced as "Huff", your second summit of the day will come with a fair bit of relief from your previous climb to Dix. After wandering around the top of Beckhorn for a few minutes to find the start of the herd path, I found the trail continuing on up Hough to be fairly mild. Absent of any official survey markers, a yellow tag pinned to an old and scraggly tree will signify you have reached the summit. Shortly after conquering Hough and getting back on trail you will arrive at our third high peak of the day, South Dix! After discovering another peak with a missing survey marker, a fellow hiker was kind enough to show us this carving on one of the summit trees. The carving read as "SDIX", signifying you have reached the true summit of South Dix. From here, to complete our full loop of the Dix Mountain Range we will need to complete a short and out and back over to Grace Peak. The additional 1.1 miles over to Grace Peak are well worth it as the views are far superior when compared to South Dix. Formerly known as "East Dix", Grace Peak offers some of the best and unique views of the entire Dix Mountain Range. As far as the eye can see, the clear and mountainous views from Grace Peak landed it as my personal favorite for the day. Not only are the views here spectacular, but at this point in the day you are over half way done with a majority of the hard efforts already out of the way. Much like our two previous high peaks, we were unable to find any official survey markers for the summit. Here is where I would take my longest break for the day, snacking on crushed goldfish and meeting an incredibly outgoing group of young hikers made for a memorable experience. Backtracking from Grace to South Dix, the climb up the backside of Macomb should be fairly easy and straight forward compared to our previous endeavors of the day. When it comes to views, Macomb is easily another favorite of the Dix Range. Looking outwards from Macomb you get both a spectacular view of Elk Lake, as well as the satisfaction of knowing that is where this journey all started from! Descending down Macomb Slide is no walk in the park, and extreme caution should be used even among the most extreme adventurers. Consisting predominantly of loose rocks, sand, and boulders, Macomb Slide was formed back when Hurricane Irene hit New York back in 2011. After having reached the summit of five Adirondack High Peaks in a single day the descent of Macomb Slide proved to be the most draining obstacle of our loop, both mentally and physically. Reaching the bottom of Macomb Slide, the herd path becomes significantly harder to follow. Fortunately, the herd path follows along a small brook that will eventually bring you back down to the high water bridge we had crossed towards the start of our journey! From the high water bridge we run our final 2.3 miles stretch back to our car at the Elk Lake parking lot. 15 miles later we arrive back at the Elk Lake parking lot where out journey began. Unexpectedly, I was the first one to return and sign out for the day as we had made relatively good time completing the full Dix Mountain Range loop in a moving time of about 5 hours. The additional 1.5 hours of time was spent taking pictures, eating goldfish, and recording an additional video segment of our single day trail run through the Dix Mountain Range.